Wise gardeners will use plants native to their area in their gardens - I try to. Whenever I see the original species on a bush walk it's like meeting an old friend. I'm proud to make the connection! Every week I try to go walking, on the peninsula hills, along the coastline, in the foothills or in the mountains of the Southern Alps. On every journey I meet these old friends - hebes, astelias, flaxes, beech trees - all in their natural environment. Nature's rock gardens and nature's water features are inspiring, and they have such wonderful designs! I've put together some pages of my trips in New Zealand. I promise I'll try and be a bit botanic, photographing and hopefully identifying the native plants I love. There should be a bit of gardening interest on every page - and lots of New Zealand 'clean and green' scenery. I'm back from a wonderful day hike in the Korowai Tussocklands. My day walks in the mountains are such good value - I re-live each small journey for days afterwards. The big views obviously inspire big thoughts, but the simplicity of walking in the outdoors, just to get somewhere else, is the key. The sense of time versus distance is so delightfully different.. 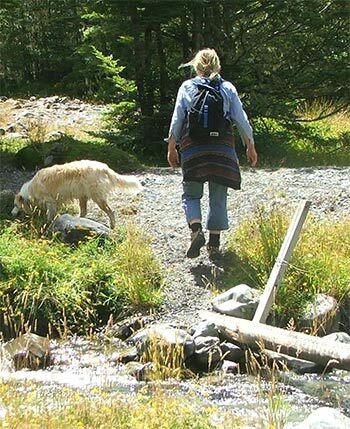 There comes a time in a mature hiker's life when certain questions loom as large as the trip one is contemplating. Take, for example, the circumnavigation of Mount Bradley on Banks Peninsula. Can my legs (or feet, or knees, etc.) still do this? Let me set the scene. Two well-equipped, experienced lady hikers (of a somewhat mature vintage) turn back within sight of Mount Oxford's challenging summit, with the widest of smiles and the tiniest of regrets. Blast! Ha! I'm back! Back from what, you might ask? OK, I'll tell you, modestly, with due respect for my great legs, sturdy heart, and my brilliant hiking boots - not to mention my wonderful foot-hugging socks, which lovingly supported my every step. I'm back from Mount Bradley. Non-Gardening Partner and I have been tramping (hiking, scrambling, boulder-hopping, even walking) up Sudden Valley in Arthurs Pass National Park. Sloshing through the cold river water, stopping to cup the hands and drink, splashing the face - the perfect place to be on a hot summer's day. I've just returned from hiking the Awatere Tussock Track, New Zealand's best ever private walking track. It's a safe, yet serious route in the high country of Marlborough. And it's left me semi-speechless - for once. I'm about to enjoy my most serious couch-hike of the summer. I'm 'joining' the third stage of Daughter of Moosey's North West Nelson Loop Trip, walking over the Douglas Range. In her words, it's a 'brute of a route'. Lately I've been too garden-busy to take days off to go hiking. The ridges, spurs and valleys have been whispering encouragements, sotto voce, but I've blocked my ears and plodded off resolutely with my garden tools and wheelbarrow. Hmm... maybe next week? The Dry Acheron track is a newly developed hiking route through two high country stations (farms) in the upper Rakaia. It wanders gently up river flats alongside the Dry Acheron Stream, which in winter, at least, is certainly not dry. Wet boots! Soggy socks! Close to Christchurch is a harbour (Lyttleton) ringed by high hills - the site of an ancient and extremely extinct volcano. A huge network of walking and running paths overlook the harbour, promising fresh air, whippy wind and breathtaking views. Foggy Peak's reputation has always attracted the seriously committed hiker in me. Finally a suitable windless (and fogless) day has dawned (and 'dusked'). I've climbed it, accompanied by Non-Gardening Partner. Amazing. We've been on 'that' serious hike again in the Craigieburn Forest Park - up to Camp Saddle, along a ridgeline for nearly two hours, and then down a scree slope, which I call 'The Big Scree' (when I want to impress my low-horizon friends). The essential ingredients of a cliff-top walk are simple - the sea below, and a path above. There's no need for extras or shortcuts - just a track which wiggles in and out, following the edge of the land. I've just been intrepidly hiking with my friend in the mountains. We had a brilliant trip - three nights away on the Hurunui Track in the Island Hills High Country Station. The Cape Campbell lighthouse, painted in fat black and white stripes, perches at the end of a finger of land on the East Coast of New Zealand's South Island. It pops scenically into view at the end of the second hiking day on the Cape Campbell Walkway. I'm supposed to be a gardener, interested in plants and shrubs and trees. Oh dear. The only plant life photographs I took on the Cape Campbell Walkway were of Cordylines - New Zealand's iconic Cabbage trees. As well as wild views the Cape Campbell Walkway guide book promised us lots of wildlife, from sea life lounging on the beaches to birds being buffeted in the fresh air. We'd also be sharing the track with many regulation farm animals - and rabbits. Aargh! The signposts and shelters on the Cape Campbell Walkway are wonderful morale boosters. Arrows give confidence, local names cause much giggling, and the shelters are perfect rest spots. And a sign saying the next shelter is only 300 meters away is worth a thousand hand-drawn maps! Hiking out in the open on the Cape Campbell Walkway - what a refreshing change from walking back and forth, around and around my own garden! Fifty-seven kilometres, four full days, with a topographical map and a hand-drawn guide - and brilliant weather. The Cape Campbell Walkway runs in a loop over two hill farms on the East Coast of Marlborough, New Zealand. It's a four day hike in the fresh air with spectacular views of sea, cliffs and mountains - a walkway which is 'a little on the wild side'. The Charming Creek Walkway is a three hour hike in the hills near Westport, on the West Coast of the South Island, New Zealand. A creek? No way! Charming? More like dramatic and slightly scary - and very beautiful! My latest trip with the walking group was in the Korowai/Torlesse Tussocklands Park. It was the gentlest of strolls, firstly through low valley fog, later in sunshine with a cooling breeze - the perfect lazy trip for a gardener's day off. I've just taken a short trip over to the West Coast to 'see' two of New Zealand's easily visited glaciers - Fox and Franz Joseph. Both are spectacular, seeming to tumble down from the Southern Alps into the temperate rain forest beneath. On a calm day the New Zealand mountains are magical. It is inspiring sitting on a saddle in the sunshine eating a good lunch, enjoying panoramic views of mountain ranges, ridges, valleys, and rivers. What a wonderful country! I'm back from a day journey climbing Mount Oxford in the Oxford Forest, North Canterbury. What a day! Do I have enough energy left to write up this trip report? Do gardeners ever get sick of their gardens? Ha! Waterfalls are nature's most dramatic kinetic sculptures. For the water it's simply a matter of potential energy, and the need to find lower ground. For bushwalkers it's more a matter of magical energy and watery wondering. Climbing up Bealey Spur is one of the favourite day trips for Canterbury hikers - and gardeners having a day off. They can enjoy big dreams, gazing deep into mountain valleys - high enough to feel important, low enough to be safe. Mount Alford in the South Canterbury foothills is a great trip for intrepid day-walkers. Our trip takes place in early spring, on a perfect sunny day. Hmm... Should I really be at home working hard in my garden? At 1049 meters, Mount Richardson is an excellent winter's day trip near Oxford (that's Oxford in New Zealand!). There's a satisfying loop track through the beech forest, over the tops, and down again. What do retired gardeners do on their days off? Explore their local area, of course, by walking, hiking - and bicycling. My first serious bike journey took me (and a friend) on a newly constructed rail trail, from Motukarara to Little River.